Last month we were invited to a cioppino dinner at the house of a close friend. Our soup bowls were piled with perfectly cooked seafood: Dungeness crab in the shell, crab meat, mussels, clams, prawns, plump scallops and fillet of white fish in a complex soup of fish stock, tomatoes, seasonings and Zinfandel. This was a contemporary version of the classic soup of San Francisco’s Fisherman’s Wharf. 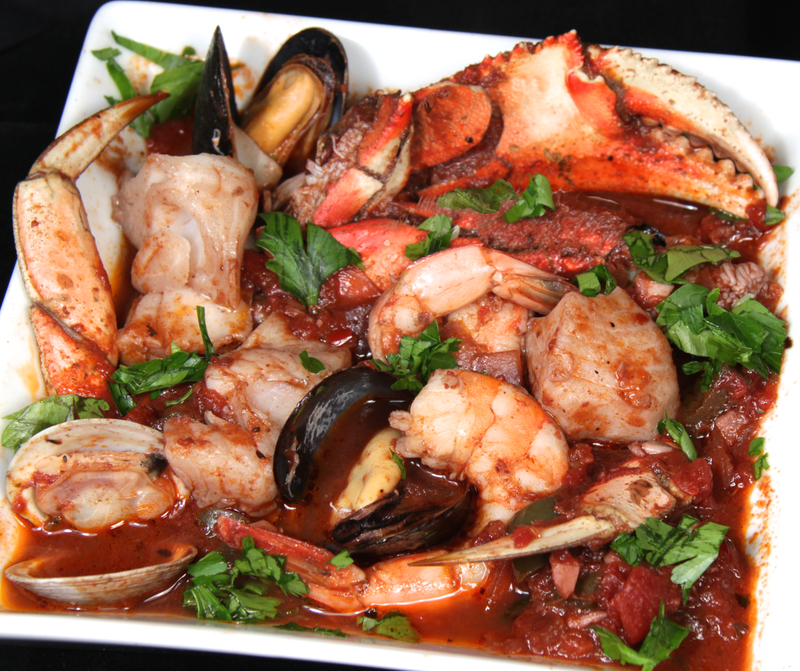 Food historians generally agree cioppino originated with Genoese fishermen in 19th century San Francisco. Felucca style sailing boats were centered in Italy Harbor (now known as Fisherman’s Wharf) and by 1882 there were 1,000 boats and a thriving trade union called The Italian Fisherman’s Association. 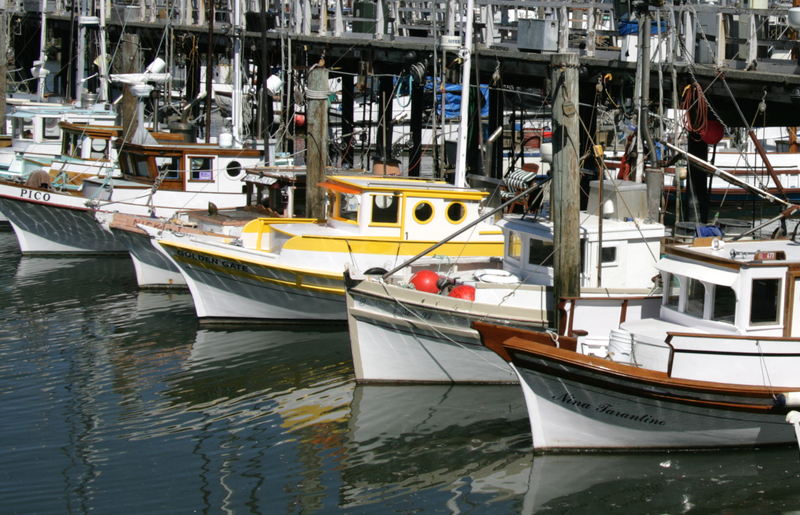 In the early 20th century small gas engine powered Monterey-Hull boats, still seen at the old wharf today, made it possible to fish more days and go further out The Golden Gate, improving the catch. On the docks, a communal pot of the Ligurian seafood soup known as ciuppin evolved into cioppino. Required elements were tomatoes, wine and a variety of fish, (whatever the catch of the day brought) and stale bread to line the bottom of the soup bowls. By the 1930’s seafood restaurants in the North Beach were featuring crab cioppino with cracked Dungeness crab cooked in the soup and sour dough bread alongside. 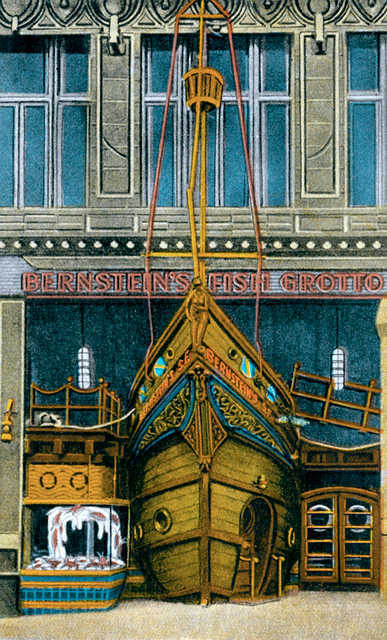 Bernstein’s Fish Grotto, a Union Square landmark from 1912-1981, added lobster and halibut to the dish. Today, SottoMare Restaurant in North Beach is noted for their cioppino: a tureen of crab and seafood in a simple tomato based soup over penne pasta. Many restaurants in The City serve a similar recipe, not always carefully executed or as tasty as you envision. I find recipes that use both white and red wine, add fennel or green peppers, chili flakes, chicken stock, olives, basil. For us to recognize it as cioppino, however, the essential components haven’t changed: fresh Dungeness crab simmered in a soup of tomatoes and wine. My friend used a cioppino recipe from Scott’s Restaurant that she cut out of the Chronicle years ago and enhanced it with a recipe for California Shellfish Stew from one of the Silver Palatte Cookbooks. The result was a balanced base of fish stock and tomato, exceptional richness from a heavy dose of red wine, ample seasonings and carefully cooked fresh seafood …a cioppino of her own. To make cioppino that is better than the restaurants really only requires a superior soup base and taking the time to cook each type of seafood properly. Make the soup ahead. At service time have all your seafood cleaned and ready. Cook each type of seafood separately in the soup until just cooked and remove to heated soup bowls. It takes only a few minutes and the care you take will ensure an exceptional cioppino. In a large soup pot sweat the onion in the butter and oil over medium heat until soft. Add everything except the seafood and parsley to the pot. Bring to a boil. Reduce heat and simmer partially covered for 30 minutes. Taste and add salt if needed. Soup can be prepared several days ahead. Meanwhile soak the clams and mussels in a bowl of water for 30 minutes and rub their shells clean. Discard any open ones that don’t close when rapped firmly. Peel the shrimp, cut along the back and remove the vein. Cut the fish fillets into 2-inch sized portions. Cut the crab body into 6 segments and see that the legs have been cracked. Heat four large soup bowls in a low oven. Bring the soup to a slow boil. Add the clams and cook until they open, about 6 minutes. Remove from the soup and divide between the warm bowls. Add all the crab and cook until just firm, about 5 minutes. Divide between the bowls. Cook the mussels until open, about 3 minutes and remove to the bowls. Cook the shrimp and fish just until the shrimp turn pink, 2-3 minutes, and add to the soup bowls. Ladle the hot soup over the seafood and sprinkle with chopped parsley. Serve at once with small forks or picks to remove the crab from the shell, shell bowls and plenty of paper napkins or finger bowls. Love the version at Sotto Mare in North Beach.